Editor’s Note: Welcome to the sixth annual Holiday Digest—a collection of fiction and nonfiction stories published in the Indy by members of the Third Street Writers, a nonprofit dedicated to fostering literary arts in Laguna Beach. As Hailey entered the Winter Festival’s red gates, she wanted to burrow into the sawdust and never come out. Two giant nutcrackers guarded evergreens loaded with handmade ornaments. Next to a gingerbread playhouse, Mrs. Claus photographed children dancing in clouds of fake bubble snow. Instead of filling her with joy, the scene made her miss Washington, D.C. and her dad. As if that was possible. Christmas was her favorite holiday, and there was no place less Christmas-y than Southern California. Too sunny and warm, Laguna and its surfing Santas and neon palm trees hardly instilled the Christmas spirit. For Hailey, Christmas meant singing carols beneath the National Christmas Tree and ice-skating at Washington Harbor. As for friends, Hailey felt completely out of place amongst the tanned, flip-flop-clad Thurston kids with her ghost-white skin and black Army boots. And now she had to spend her Saturday with Dylan. “How do you like it here?” Dylan asked as they wandered over to the glassblowing exhibit. A cool breeze kicked up, swaying the twinkling lights draped overhead. “It’s okay. Different from D.C.,” she said. The artist plunged an orb of red-hot glass into a bucket of water with a sizzle. That’s what she felt like—burned out, joyless. She’d said the wrong thing. A wall of fog approached, blotting out the waning sun. Dylan pulled his hood over his sun-bleached hair and stuffed his hands into his shorts pockets. Hailey followed him up the slope to a giant wooden water wheel. The water glittered with pennies and dimes. A wish. There was so much she could wish for. I wish my parents were back together. Inhaling the aroma of popcorn, she tossed the penny. It promptly bounced off the spinning wheel and shot into the sawdust at Dylan’s feet. She inwardly groaned. She couldn’t even make a wish right. I wish I could move back home. She threw the coin, cringing as it clanked against a metal urn and landed on a rock. The fog crept in, sending a chill down Hailey’s spine. She flicked her wrist and held her breath. The penny splashed solidly in the top of the wheel and cascaded into the pool. The wind picked up, rattling the booths’ homemade signs. Tiny stars swirled before her eyes, and for the first time in a while, Hailey felt something close to happiness. “No way,” she gasped, holding out her hand. “Unreal!” Dylan stuck out his tongue to catch the flakes. She spread her arms and spun around, the flakes sticking to her eyelashes. And then, like someone flicked a switch, the snow stopped. “I can’t believe it snowed,” Dylan said. Hailey wiped melted snow from her cheeks. Her parents weren’t getting back together and she wasn’t moving home, but something magical had just happened. Maybe Laguna wouldn’t be so bad after all. Amy Francis Dechary left the slush and cold of Washington, D.C. 10 years ago and now is raising her children in Laguna Beach’s bubble snow and sunshine. She is president of the Laguna-based Third Street Writers. Last summer, a neighbor I had just met commented that she liked the lights on our house. “Can you tell we’re Jewish?” I asked. Those electrified strings of white and blue are what’s known in our family as “holiday lights,” left up throughout the year and illuminated for any celebration involving guests and food. Now that the year’s come almost full circle, we’re again pausing to light our menorah each evening for the eight nights of Hanukkah. As the Jewish calendar so often does, it’s colliding this season with our Gregorian year. The holiday starts on Dec. 2, only a week after we return from a family road trip to my mom’s for Thanksgiving in Tucson. Inevitably, with jobs and distance conspiring to keep us from candle lightings with our grown daughters, we’ll manage to gather around the menorah as a family only a few of the holiday’s eight nights. We’ll say traditional blessings and watch the candles until they go out. At the end, we’ll have burned through another box—44 candles in all. For our family, Hanukkah—a minor holiday celebrating the miracle of a temple lamp that burned for eight nights with only a small amount of oil—has never been about presents. Instead, it represents another chance to sit down with friends and family to a huge holiday feast of latkes, beef brisket, eggy challah bread and a sinful, addictive chocolate-toffee confection (irreverently known as “Matzo Crack”) that I make by the trayful. 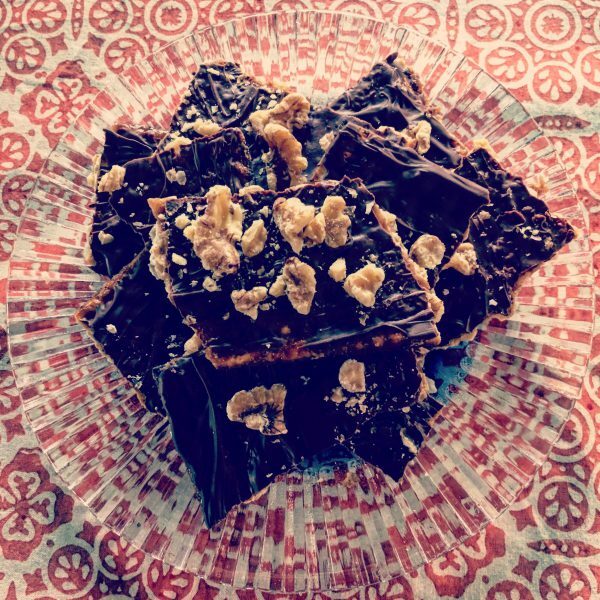 An addictive chocolate-toffee confection (known as “Matzo Crack”) that Ellen Kempler makes by the trayful for Hanukkah. Since our ancestors kindled the first fire, light has helped sustain us through darkness. While we learned long ago that the warm glow of a hearth, candles and strings of lights can’t protect us from dangers outside, they can symbolize hope in times of darkness, help us to celebrate the world’s joys,and remind us to feed the flames of love, understanding and tolerance wherever we are. After a searing year of hate crimes, mass shootings, mail bombs, wildfires and other climate catastrophes, this is a message that we all need more than ever, now and in the future. This year, I’m switching on the holiday lights and putting our menorah in the window for everyone to see. A 20-year Top of the World resident, Ellen Girardeau Kempler is a former Laguna Beach Indy columnist, poet, essayist, feature writer, photographer, and founder of Gold Boat Journeys Creative Cultural Travel. Her book “Thirty Views of a Changing World: Haiku + Photos” (Finishing Line Press, December 2017) is available at Laguna Beach Books and on Amazon. I open the glass china cabinet doors and the deep, dusky smell of mahogany rushes out. This big, dark brown piece of furniture doesn’t belong in my tiny condo in a town that’s warm, hip and cool even in December. This china cabinet belongs in the Norman Rockwell homes of the Northeast, where holiday gatherings are a warm refuge from the cold, white snowy landscape that is winter. It doesn’t reflect the area where this year’s popular gift is the tea towel from Tuvalu’s which features Santa driving a VW van, surfboards on top and a vanity license plate which reads, of course: Laguna. I look up the Salvation Army pick-up schedule. They can get here Tuesday, so it’ll be gone before Christmas company arrives. The extra space in the living room will be appreciated. I gaze into the well-crafted shelves, admiring the wood that’s been home to china and Waterford collections as well as those silver Paul Revere bowls my dad won at golf tournaments. It’s housed a baseball signed by Mickey Mantle and a smattering of important certificates—birth, communion, marriage. I doubt it ever included all of the family’s paperwork in one place, as organization was never my mom’s strong suit. Then again, who could keep track of six birth certificates AND the kids? Since she did the latter, I’ll cut her the slack on the paperwork. But it was definitely where my dad’s death certificate was kept after he died in 2003. As for the piece itself, well, time and use have left their marks. The door key, and ultimately the escutcheon which kept the lock in place, disappeared decades ago. But the opening is just right for a pinky finger, so it’s never been an issue in a family that more often adapts to disrepair rather than fixes it. I slide open the drawer below the cabinets, which was once filled with bank account books both active and defunct. The passport-sized ledgers revealed balances lined up, documenting times of stability and times of concern. There was a receipt from my parent’s wedding night for a hotel in New York dated Sept. 14, 1946. It was about $22. At one point, my mom put some locks of our baby hair in there, taped down on pieces of paper. It was kind of creepy to some folks, but she came at it from a place of love, so it was OK. Plus, how the heck did Peggy arrive with such blonde hair and then wind up so dark-headed? The wooden doors below housed boxes of silverware, platters—all the things the next generation doesn’t want. As I gaze at the piece, I hear my mom telling me for years how much she wanted me, not the other siblings, to have her dining room set. She’d bought it on layaway and felt so proud when they had a formal place for gatherings—an indicator of their achievements moving upward from an unfurnished cold-water flat to a home in the suburbs. I managed to give away the dining room table and Duncan Phyfe chairs guilt-free; I had a nephew moving into a new home with his wife, but they didn’t have room for the china cabinet. So, I bought the farmhouse table I always wanted and kept the piece. All things do have a time and place. I once again breathe in the deep wood smell as I begin removing my own plates and glasses from the cabinet. I turn, go back online and cancel the pickup. This cabinet will oversee one more Keegan Christmas. Theresa Keegan is a freelance writer who finds sentimentality keeps thwarting her attempts at becoming a minimalist. Her work appears in state and national newspapers and magazines.